Wondering how long it will take to study for, and pass, the CPA exams? Finding that everyone has a different metric, or they’ll only tell you once you’ve signed up for their course? Well, let’s dispense with all the bait and switch. Here’s what I recommend. For success, full-time working professionals should schedule at least 15 hours of studying time per week over a twelve month period to pass all four exams. That’s a long-term commitment, and obviously needs to flex around your personal schedule. While yes, the CPA exam requires a commitment to pass, all work and no play makes a burned out candidate. That’s why Yaeger offers 18 month access to our course bundles (with the ability to extend to 24 months); we understand that life stops for nothing, even a CPA candidate. REG: 2.5 to 3 months. If you are working in taxation full-time, you may need less, however please do not think that just because you work in taxation you do not need to study. If you have worked in and are familiar with auditing, you may need less time, however, again, please do not think that just because you work at an auditing firm, you will pass without studying. Academic concepts are often different than what you’d see on a day-to-day basis on an audit engagement. What gives people problems with BEC is the IT section. Because IT is constantly changing, it’s really a current event topic. One of the most common mistakes is to assume that BEC is the “easiest” section. BEC isn’t the “easy to pass” section any more and can also be challenging for candidates that are not native English speakers. 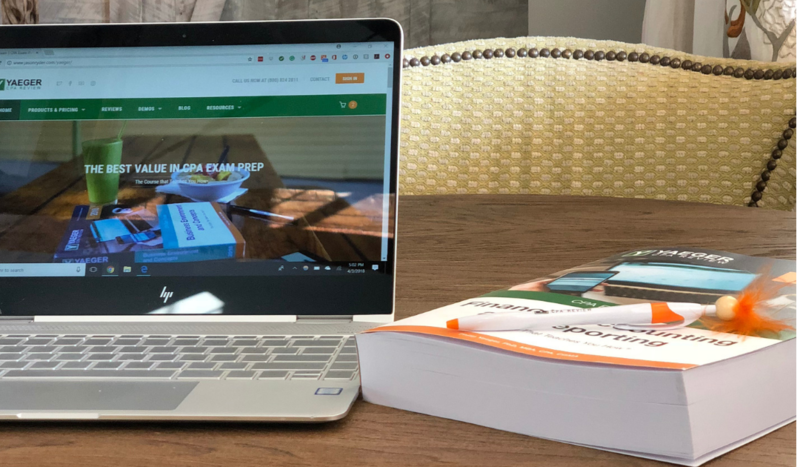 Do you want a customized CPA Exam study solution? Watch the AdaptaPASS DEMO NOW! *The timelines for each of these tests assume that 1) at least 15 hours a week is being spent studying, and 2) the last two weeks of each study period is spent reviewing the blueprints and taking our CRAM course. The difference between taking CRAM and not taking it is, on average, 5-15 points. This schedule allows candidates plenty of time to adequately prepare for each section effectively and efficiently without worrying about rushing. Taken in this order, each section will build on the prior test(s), and help to pass consecutive ones. For example, by tackling FAR first, you will have learned skills and facts that are needed for REG and AUD. Following the schedule above will result in the BEST chance of passing each section the first time, including BEC. For all of our Yaeger students, once you’ve purchased your all-access or single-part course bundle, you have access to our AdaptaPASS program, which designs a learning platform for you based on your learning style. Based on your input, a personalized combination of content in the form of video lectures, audio lectures, and textbooks are created - taking the guesswork out of the equation. You also have access to our CPA instructors, including myself, to design a study timetable with you. We mean it when we say that Yaeger is the course that teaches you how - we are personally invested in your success. It’s time to stop trying to memorize facts, and time to start understanding the concepts- that is how you will PASS the CPA EXAM! If you have any more questions, watch the DEMO video. If you still have questions or want to get started, call me, or talk with one of our CPA Exam Specialists today.